MAXX Mobiles has a new innovative series of KHAMOSHHH… handsets. 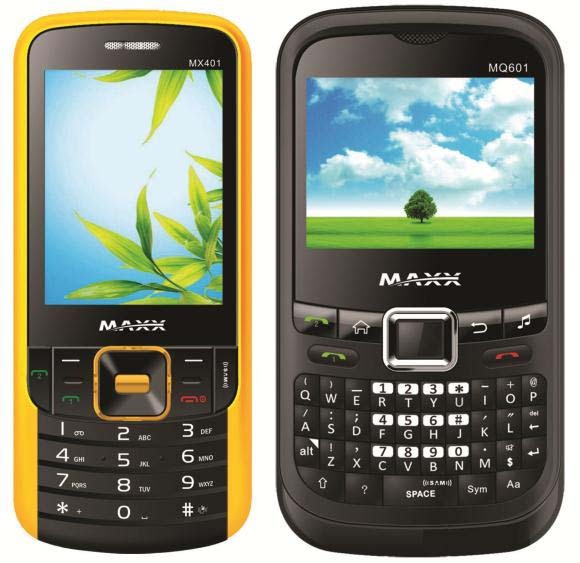 The range includes two handsets, a bar phone, MAXX MX401 and a QWERTY handset, MAXX MQ601. These handsets have the revolutionary SAM™ technology that curtails external background noise. The SAM technology employs an innovative signal processing technique to suppress ambient noises and to eliminate echoes. The phones also come with a dedicated key to activate the Noise Suppression feature. The level of noise suppression desired can be pre-set through the “Call Settings” menu. The MAXX MX401, priced at Rs 2,833/- has a 1500 mAh battery, dual-SIM, support for MP3/WAV/AAC audio and 3GPP/AVI/MP4 video player a 2MP camera, a 2.4” TFT screen, big speakers, FM Radio (with FM scheduling ) and Opera Mini Browser. The handset is available in two colours, Yellow and Blue. The MAXX MQ601 is a QWERTY handset prices at Rs. 2,970/-, and is available in two colours Black and Grey. Its features include dual-SIM, 2MP camera, a 2.3” TFT screen, a 1000 mAh, JAVA enabled ,support for various audio (MP3/WAV/AAC) and video (3GPP/AVI/MP4) formats and wire-free FM Radio (with FM scheduling).